"It's all coming out now!" IFC Films has debuted an official trailer for a documentary titled Tea with the Dames, a film that gets four great acting icons together for some afternoon tea. Similar to the discussion film Muppet Guys Talking, this brings together four ladies to let them chat about whatever they want from their past - their lives, their profession, and everything else. Dames Eileen Atkins, Judi Dench, Joan Plowright, and Maggie Smith have let the cameras in on a friendship that goes back more than half a century. The four acting greats discuss their careers and reminisce about their humble beginnings in the theatre. 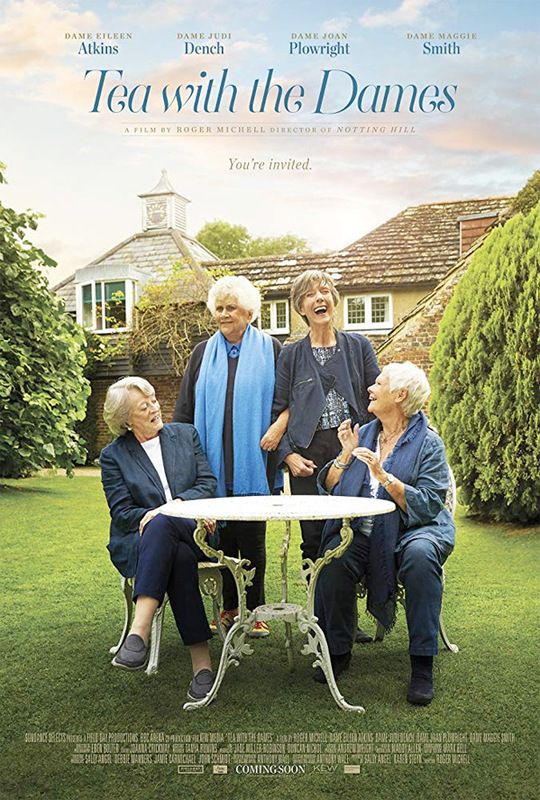 This was released in the UK in May under the title Nothing Like a Dame, but I like Tea with the Dames a bit more, especially when they put in the bit at the end about her wanting champagne. Good times. What happens when four legends of British stage and screen get together? Dame Maggie Smith, Dame Judi Dench, Dame Eileen Atkins, and Dame Joan Plowright are among the most celebrated actresses of our time, with scores of iconic performances, decades of wisdom, and innumerable Oscars, Tonys, Emmys, and BAFTAs between them. They are also longtime friends who hereby invite you to join them for a weekend in the country as they catch up with one another, reminisce, and share their candid, delightfully irreverent thoughts on everything from art to aging to love to a life lived in the spotlight. Bursting with devilish wit and whip-smart insights, Tea With The Dames is a remarkable opportunity to spend time in the company of four all-time greats—up close and unfiltered. Tea with the Dames, originally titled Nothing Like a Dame, is directed by South African filmmaker Roger Michell, of many great films including My Night with Reg, Notting Hill, Changing Lanes, Enduring Love, Venus, Morning Glory, Hyde Park on Hudson, Le Week-End, and My Cousin Rachel previously. This already opened in the UK earlier this year. IFC Films will release Tea with the Dames in select theaters starting September 21st. Who's interested?